The Discussions Editor allows you to 1-click update attributes of any discussion on your site. For example, you might update the title or link associated with a discussion after updating it on your site itself. How do I update discussions? Simply click into any cell, enter the desired new information, and hit enter or click out of the cell. The attribute will be automatically updated and you'll see a success or error message. Discussions cannot currently be merged via this interface. For example, updating one discussion's link to be the same as another's will result in no change. To merge discussions, see our URL mapper documentation. 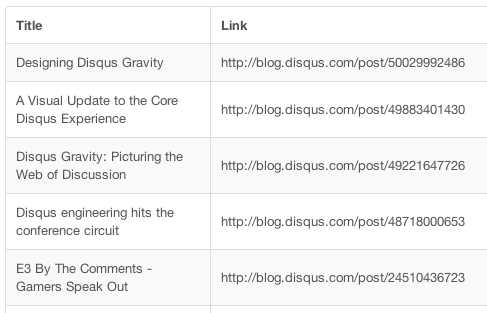 Updating an author currently requires entering that Disqus user's username, not full name. For more in the difference between the two see What is a username?. Thus, only change the author if you're confident of that person's username. What attributes can be updated? Title: appears publicly. See "Where does this information appear publicly?" below. Link: appears publicly. See "Where does this information appear publicly?" below. Author: does not appear publicly. Update this when you want a non-moderator on your Disqus forum to be considered the author for the discussion. This allows them to moderate comments on that discussion both via Disqus notification emails and inline in the commenting embed. Category: does not appear publicly. Categories are primarily used with our API for results filtering; categories are not used for moderation. Learn more about categories. Open/closed status: open or close a discussion to new comments. Discussion creation date is also included in its own column as a point of reference. Where does this information appear publicly?